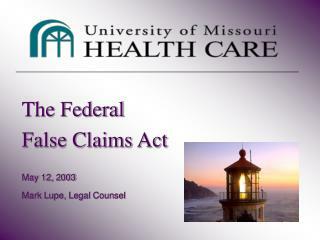 The Federal False Claims Act May 12, 2003 Mark Lupe, Legal Counsel. 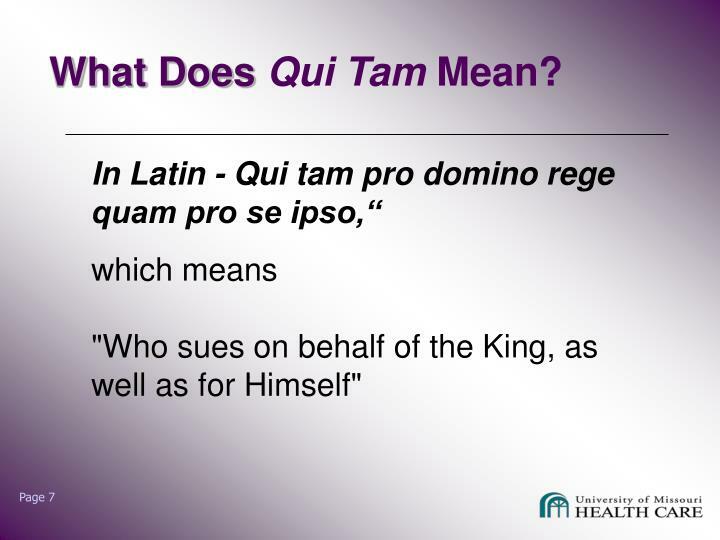 Qui Tam Actions. 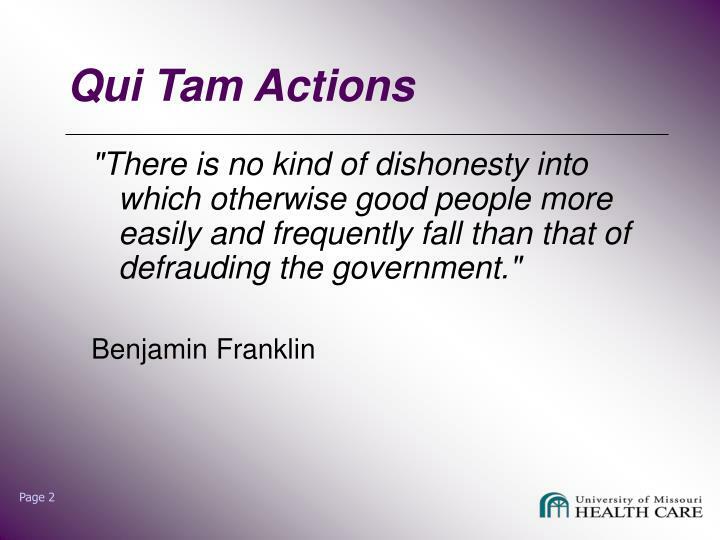 "There is no kind of dishonesty into which otherwise good people more easily and frequently fall than that of defrauding the government." Benjamin Franklin . 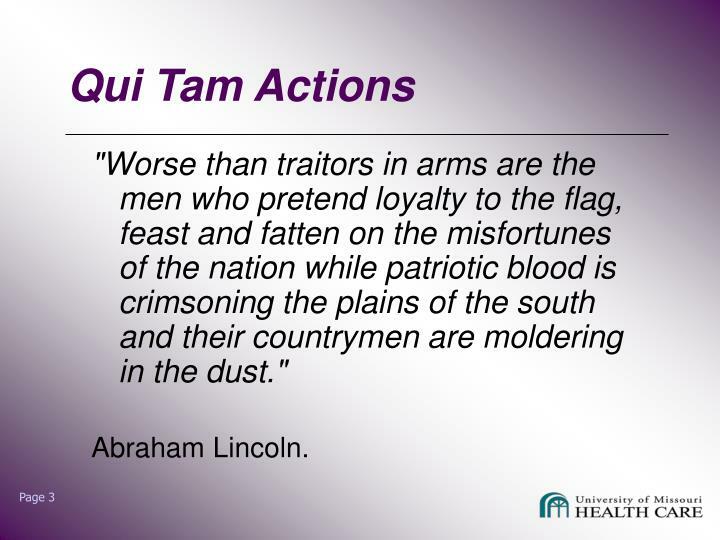 Qui Tam Actions. 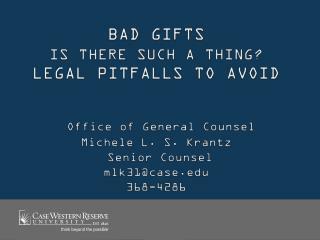 Qui Tam laws (pronounced key-tam or kwee-tam)have roots in the middle ages in England. 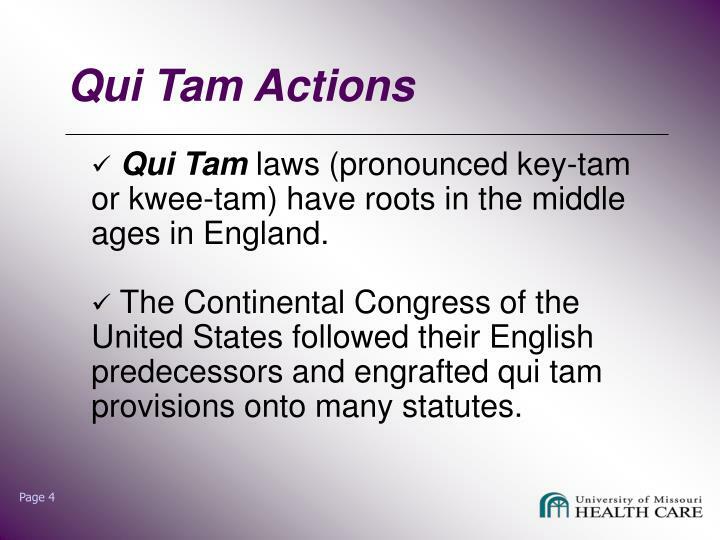 The Continental Congress of the United States followed their English predecessors and engrafted qui tam provisions onto many statutes. 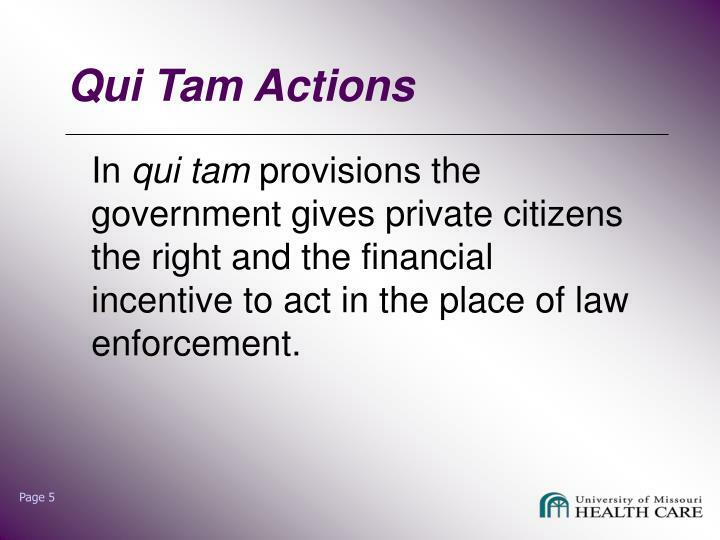 In qui tam provisions the government gives private citizens the right and the financial incentive to act in the place of law enforcement. 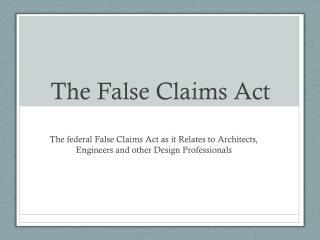 President Abraham Lincoln urged Congress to pass the False Claims Act in 1863. 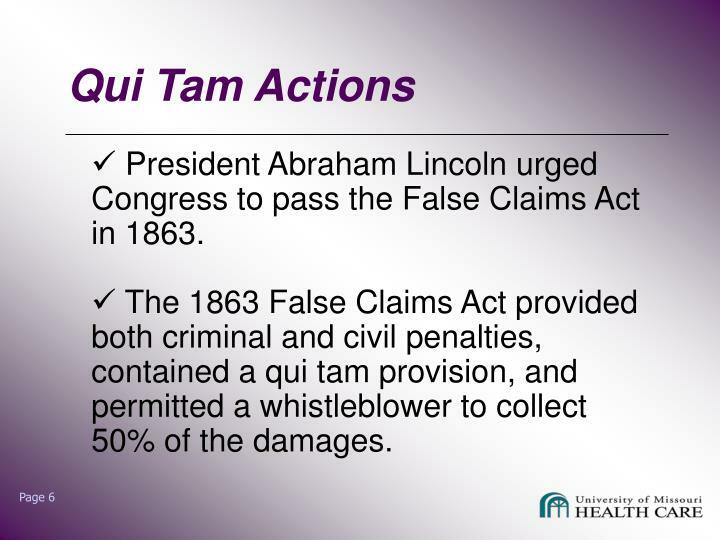 The 1863 False Claims Act provided both criminal and civil penalties, contained a qui tam provision, and permitted a whistleblower to collect 50% of the damages. 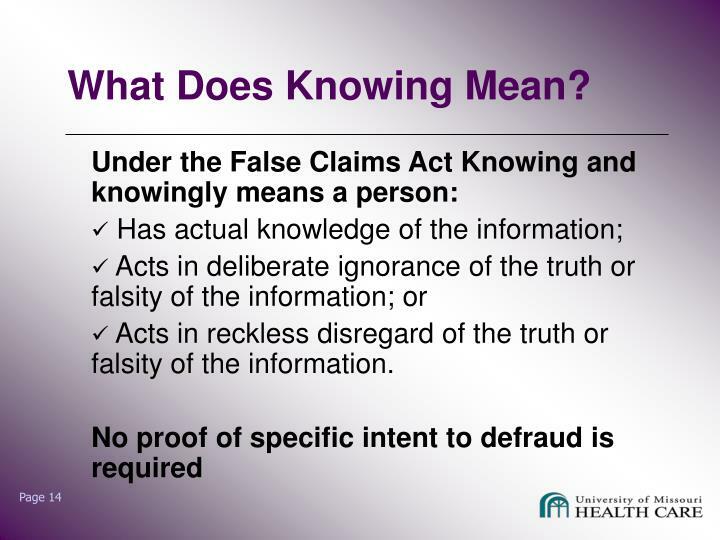 which means "Who sues on behalf of the King, as well as for Himself"
In 1943, Congress restricted the relator's role under the False Claims Act. 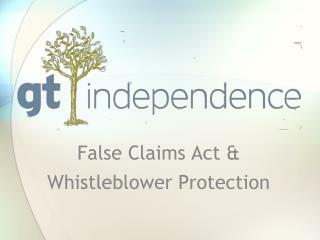 Whistleblowers could not bring claims that were based on evidence or information that was known to the government even if the government had no intention of bringing a claim. 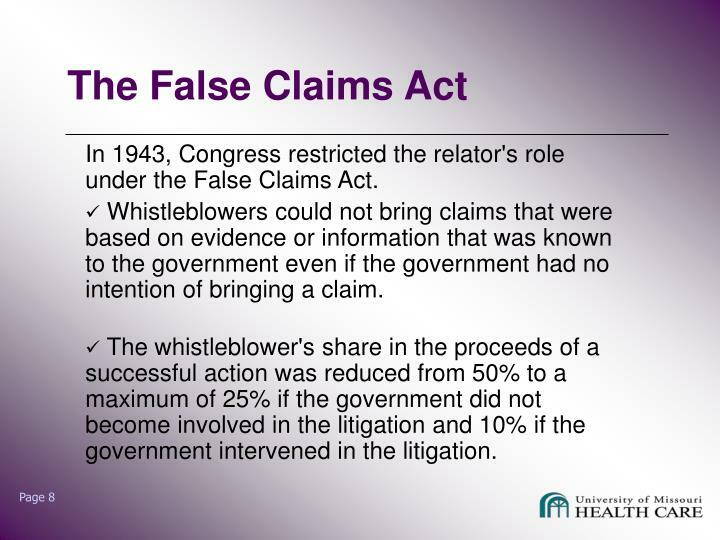 The whistleblower's share in the proceeds of a successful action was reduced from 50% to a maximum of 25% if the government did not become involved in the litigation and 10% if the government intervened in the litigation. 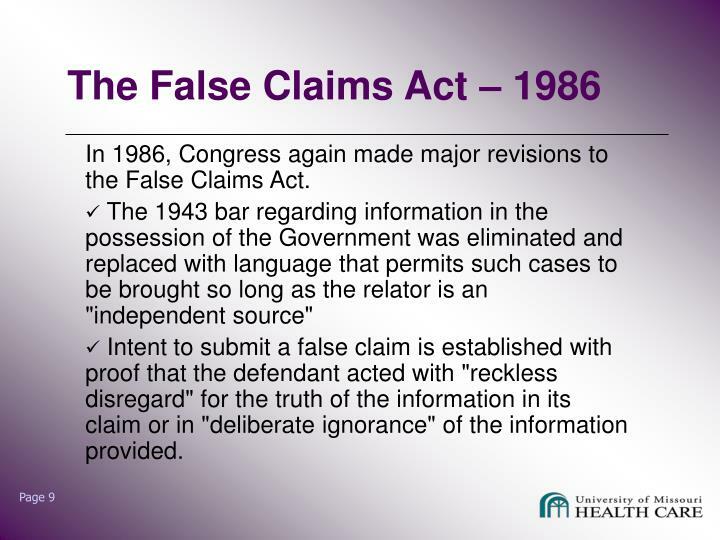 In 1986, Congress again made major revisions to the False Claims Act. 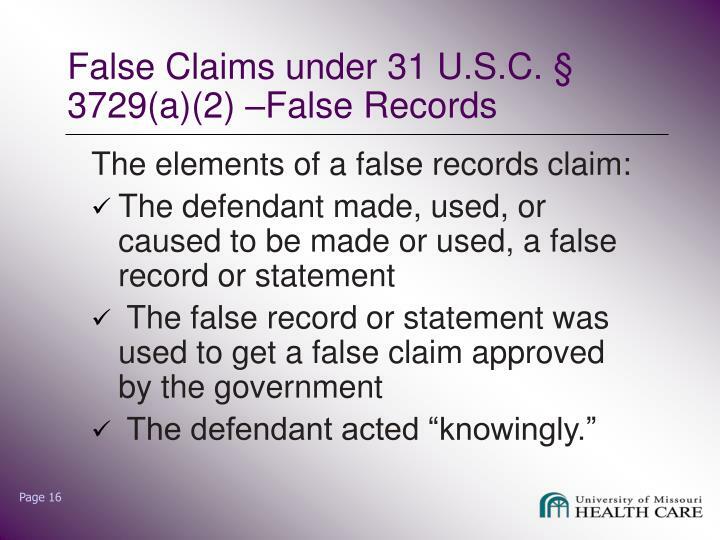 The 1943 bar regarding information in the possession of the Government was eliminated and replaced with language that permits such cases to be brought so long as the relator is an "independent source"
Intent to submit a false claim is established with proof that the defendant acted with "reckless disregard" for the truth of the information in its claim or in "deliberate ignorance" of the information provided. 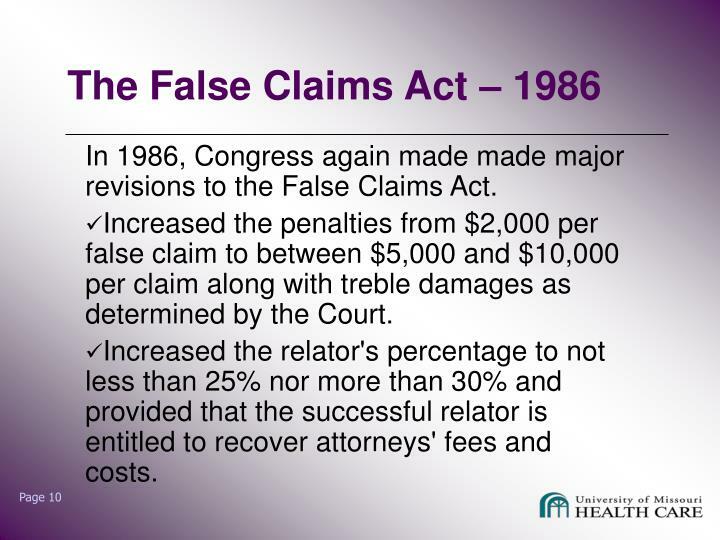 In 1986, Congress again made made major revisions to the False Claims Act. 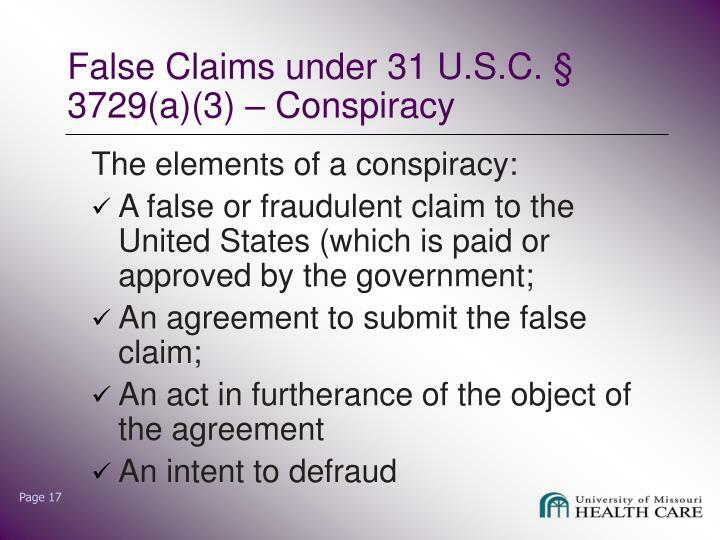 Increased the penalties from $2,000 per false claim to between $5,000 and $10,000 per claim along with treble damages as determined by the Court. 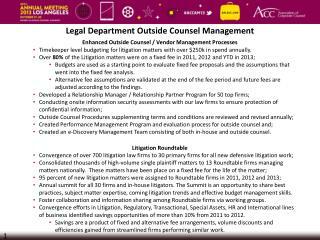 Increased the relator's percentage to not less than 25% nor more than 30% and provided that the successful relator is entitled to recover attorneys' fees and costs. 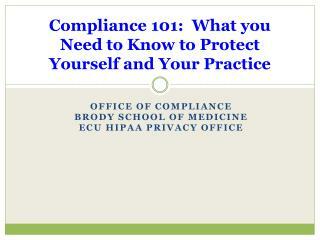 A provision which protects an employee from retaliation by the employer. 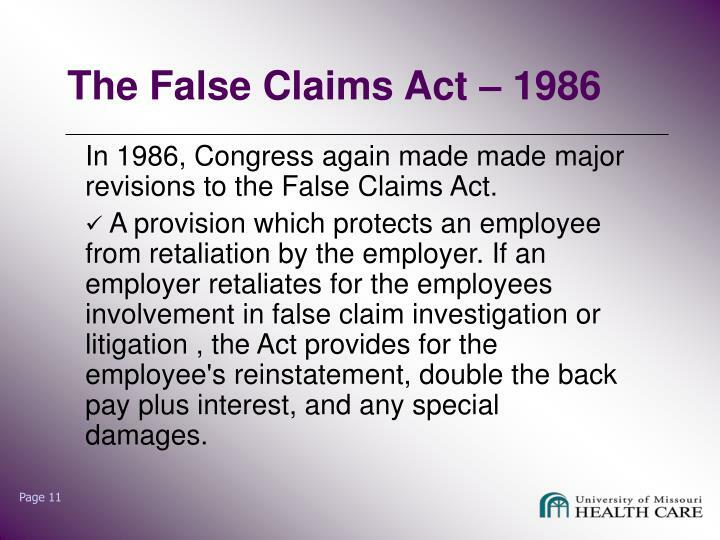 If an employer retaliates for the employees involvement in false claim investigation or litigation , the Act provides for the employee's reinstatement, double the back pay plus interest, and any special damages. 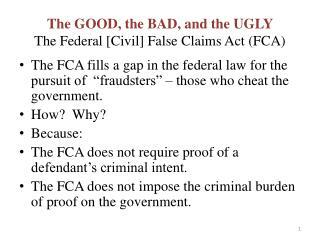 The Justice Department for the third year in a row recovered more than $1 billion in lawsuits and investigations of fraud cases against the federal government in the fiscal year ended Sept. 30,2002. 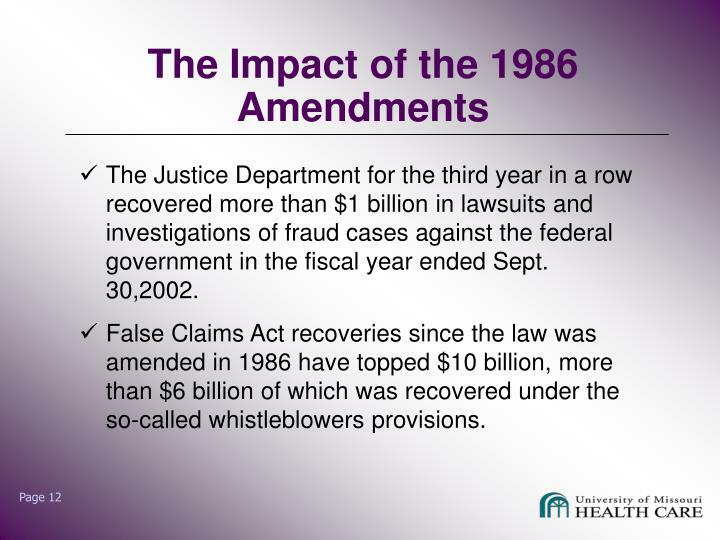 False Claims Act recoveries since the law was amended in 1986 have topped $10 billion, more than $6 billion of which was recovered under the so-called whistleblowers provisions. 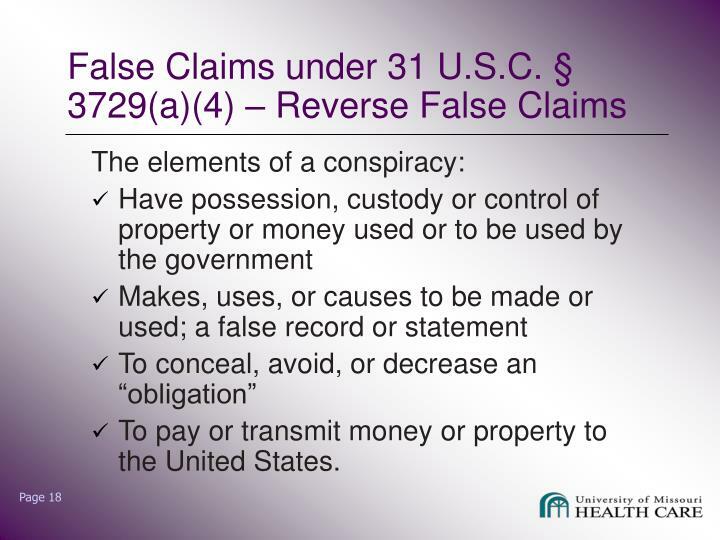 To pay or transmit money or property to the United States. 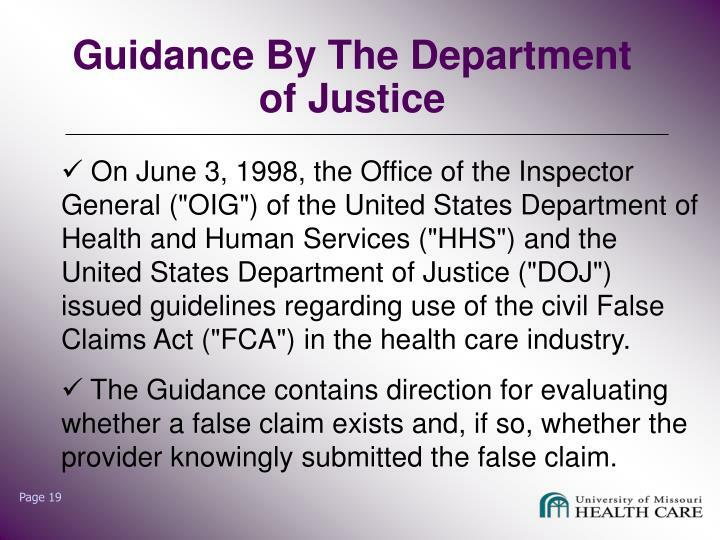 On June 3, 1998, the Office of the Inspector General ("OIG") of the United States Department of Health and Human Services ("HHS") and the United States Department of Justice ("DOJ") issued guidelines regarding use of the civil False Claims Act ("FCA") in the health care industry. 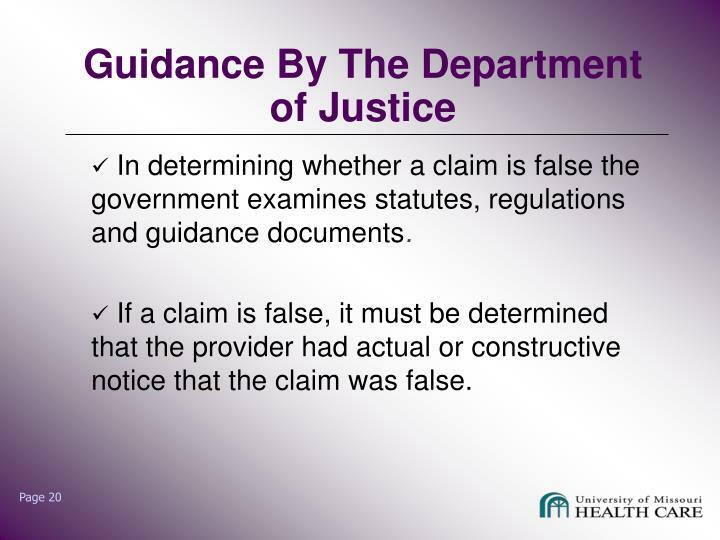 The Guidance contains direction for evaluating whether a false claim exists and, if so, whether the provider knowingly submitted the false claim. 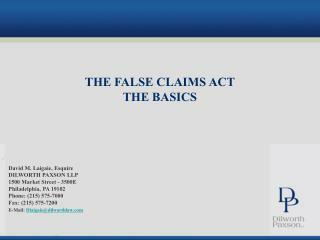 In determining whether a claim is false the government examines statutes, regulations and guidance documents. 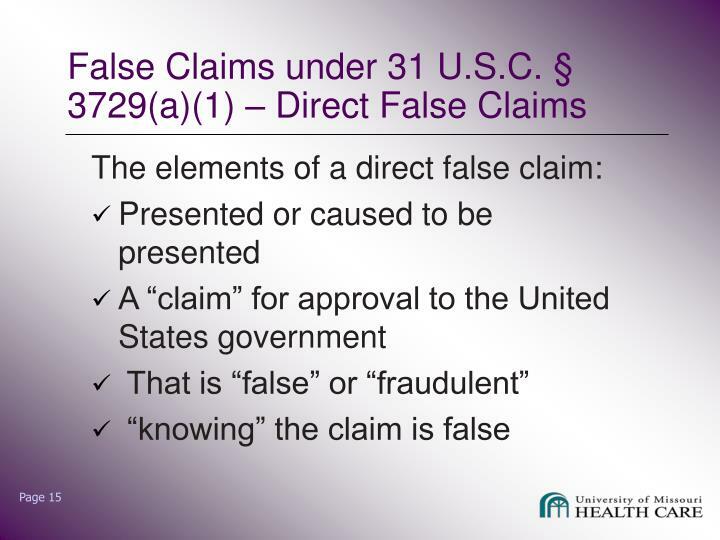 If a claim is false, it must be determined that the provider had actual or constructive notice that the claim was false. 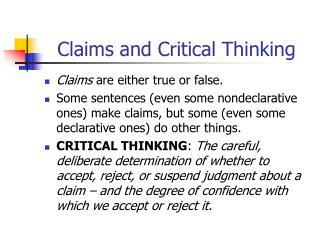 The clarity of the statute, rule or other guidance. 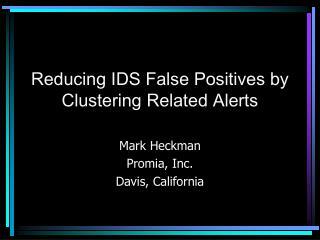 Pervasiveness or magnitude of claims activity. 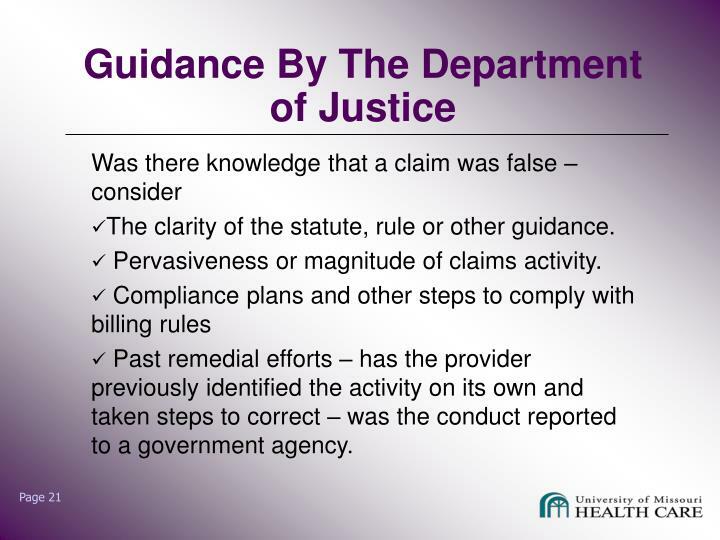 Past remedial efforts – has the provider previously identified the activity on its own and taken steps to correct – was the conduct reported to a government agency. 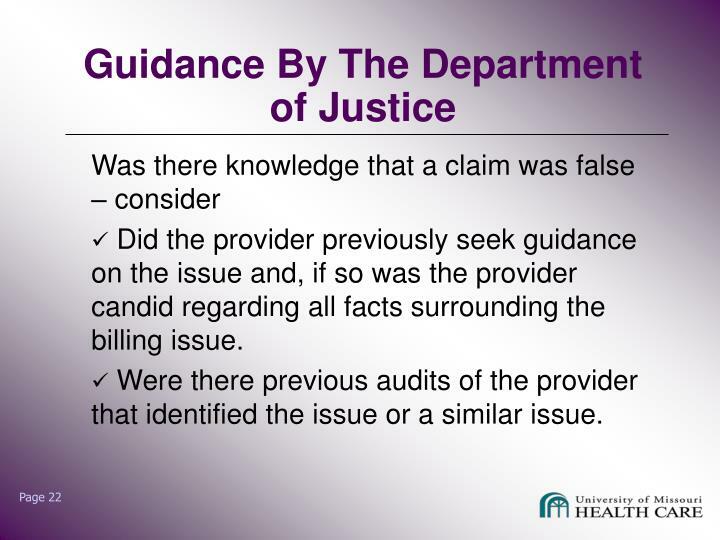 Did the provider previously seek guidance on the issue and, if so was the provider candid regarding all facts surrounding the billing issue. 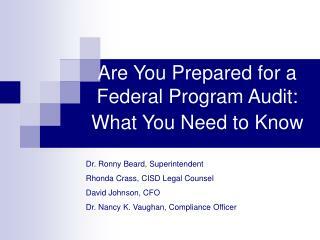 Were there previous audits of the provider that identified the issue or a similar issue. The person bringing the suit files it in the name of the United States. 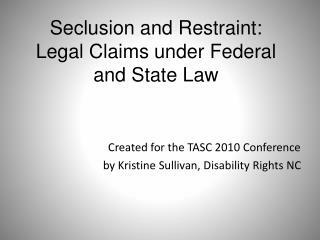 Once filed, the suit can only be dismissed with approval by the court and the government. 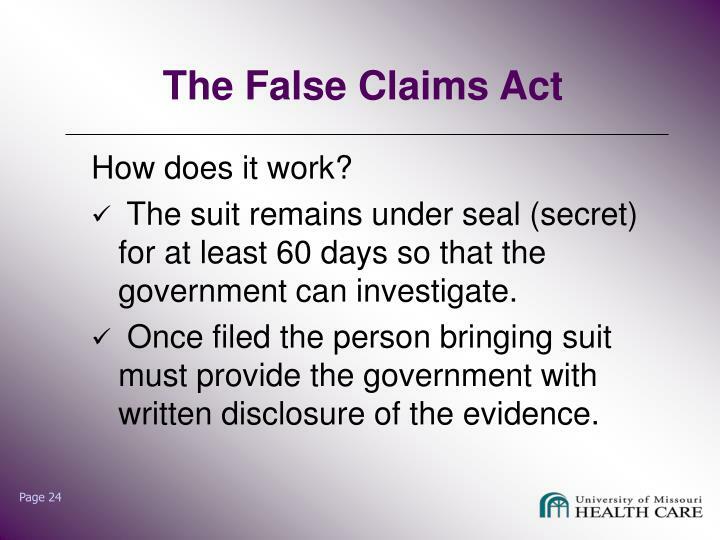 The suit remains under seal (secret) for at least 60 days so that the government can investigate. 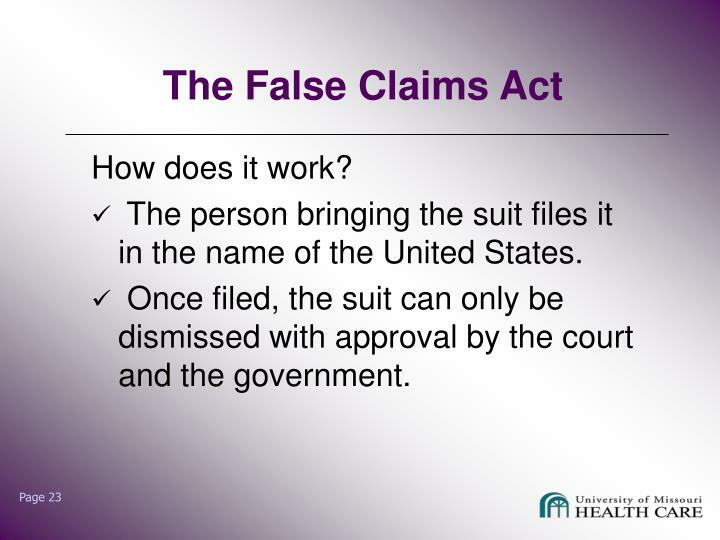 Once filed the person bringing suit must provide the government with written disclosure of the evidence. 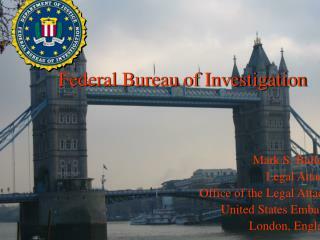 As the government investigates may expand the scope of the investigation. 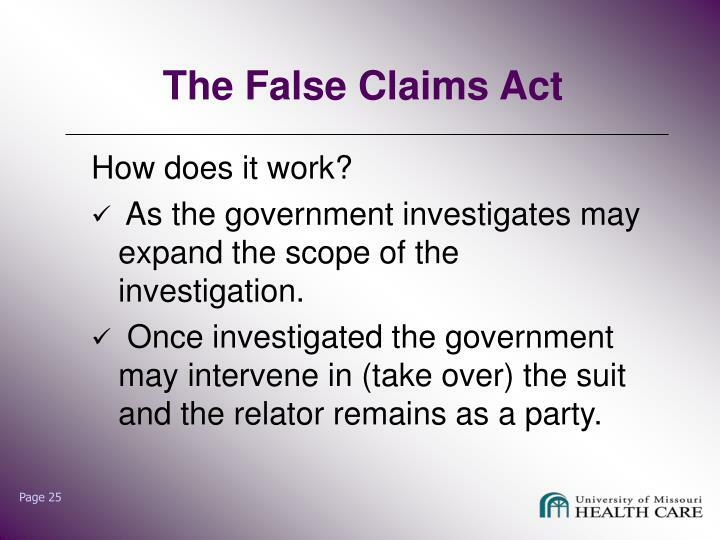 Once investigated the government may intervene in (take over) the suit and the relator remains as a party. Note that the government may elect to pursue an alternative remedy such as a civil monetary penalty. 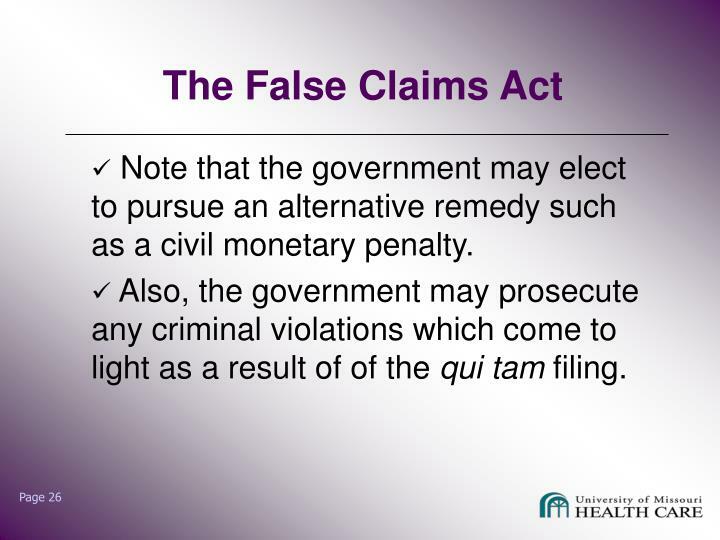 Also, the government may prosecute any criminal violations which come to light as a result of of the qui tam filing. If the government intervenes and prevails the relator will be awarded between 15% to 25%. 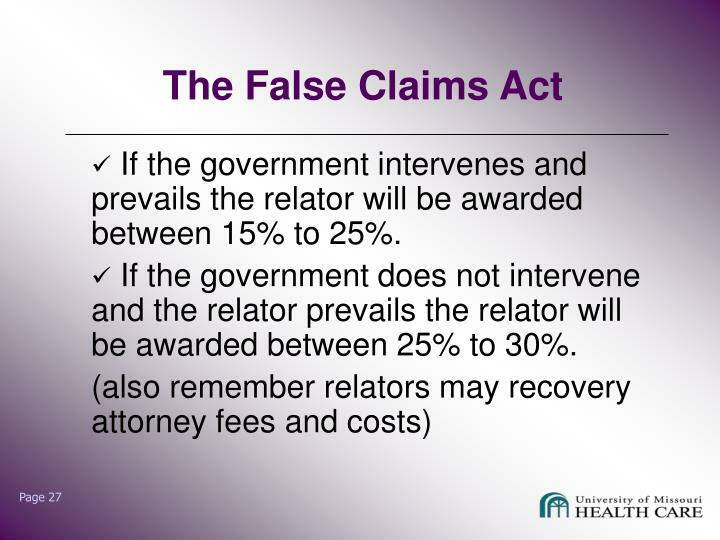 If the government does not intervene and the relator prevails the relator will be awarded between 25% to 30%. 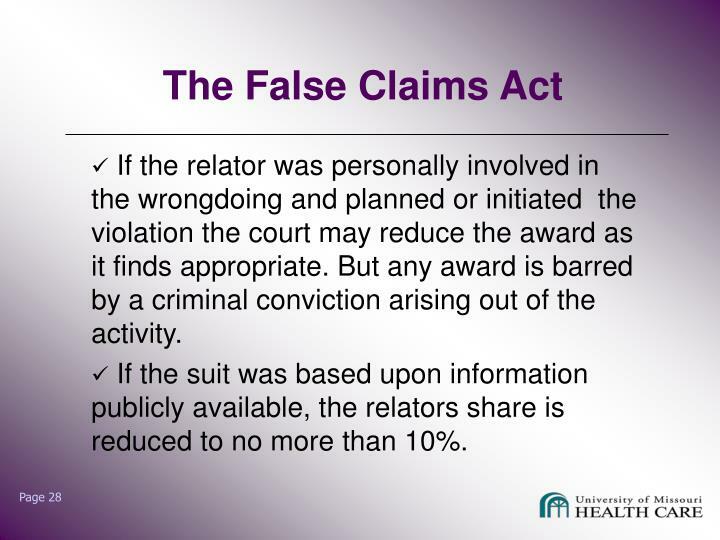 If the relator was personally involved in the wrongdoing and planned or initiated the violation the court may reduce the award as it finds appropriate. But any award is barred by a criminal conviction arising out of the activity. 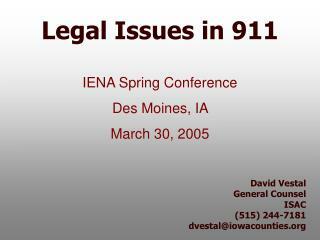 If the suit was based upon information publicly available, the relators share is reduced to no more than 10%. 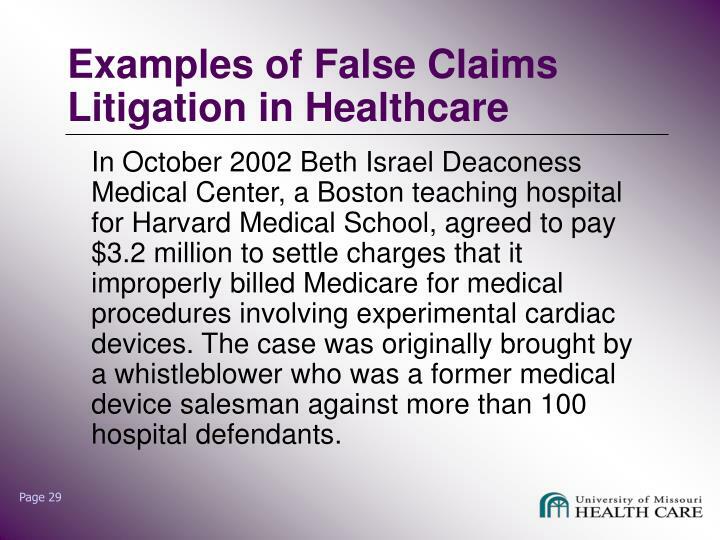 In October 2002 Beth Israel Deaconess Medical Center, a Boston teaching hospital for Harvard Medical School, agreed to pay $3.2 million to settle charges that it improperly billed Medicare for medical procedures involving experimental cardiac devices. 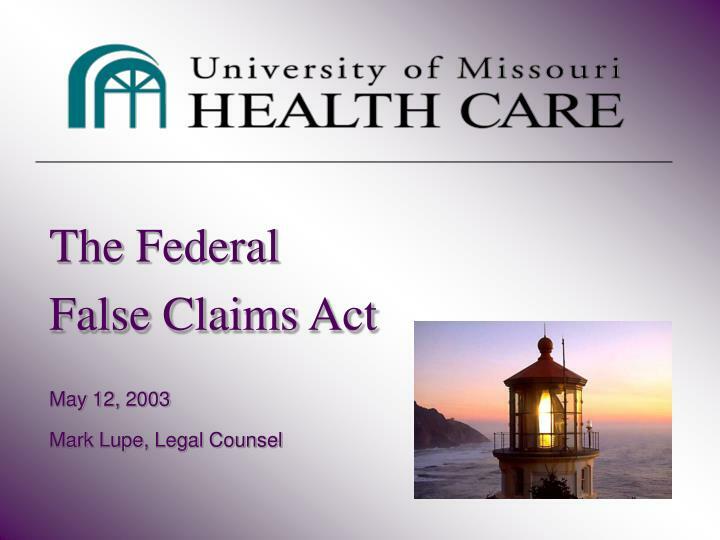 The case was originally brought by a whistleblower who was a former medical device salesman against more than 100 hospital defendants. 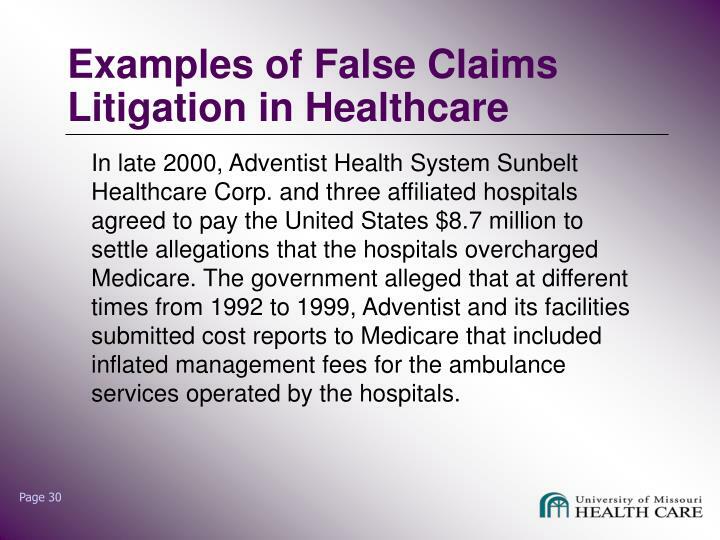 In late 2000, Adventist Health System Sunbelt Healthcare Corp. and three affiliated hospitals agreed to pay the United States $8.7 million to settle allegations that the hospitals overcharged Medicare. 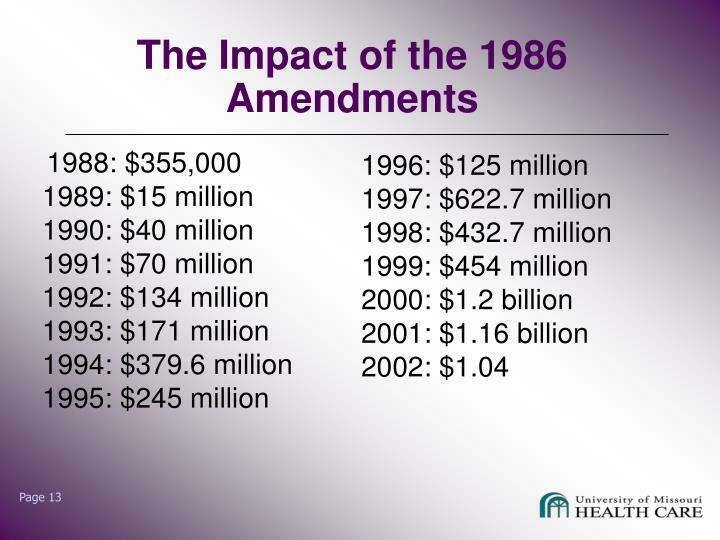 The government alleged that at different times from 1992 to 1999, Adventist and its facilities submitted cost reports to Medicare that included inflated management fees for the ambulance services operated by the hospitals. 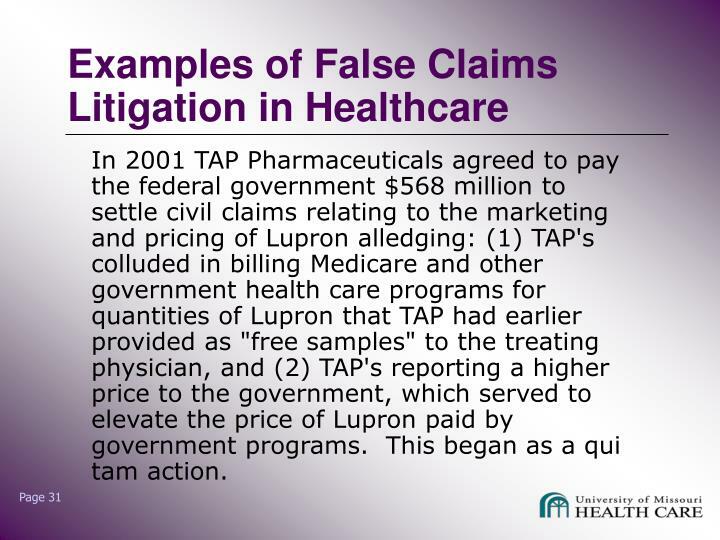 In 2001 TAP Pharmaceuticals agreed to pay the federal government $568 million to settle civil claims relating to the marketing and pricing of Lupron alledging: (1) TAP's colluded in billing Medicare and other government health care programs for quantities of Lupron that TAP had earlier provided as "free samples" to the treating physician, and (2) TAP's reporting a higher price to the government, which served to elevate the price of Lupron paid by government programs. 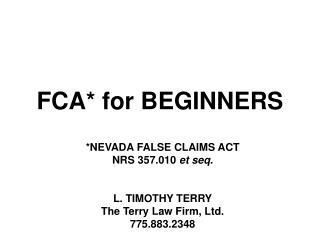 This began as a qui tam action. 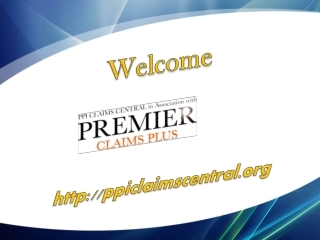 In June 2002 General American Life Insurance Company agreed to pay $76 million to settle a false claim. 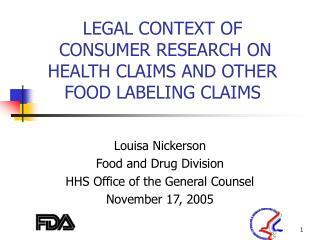 General American was a Medicare Part B carrier in Missouri until December 31, 1998. 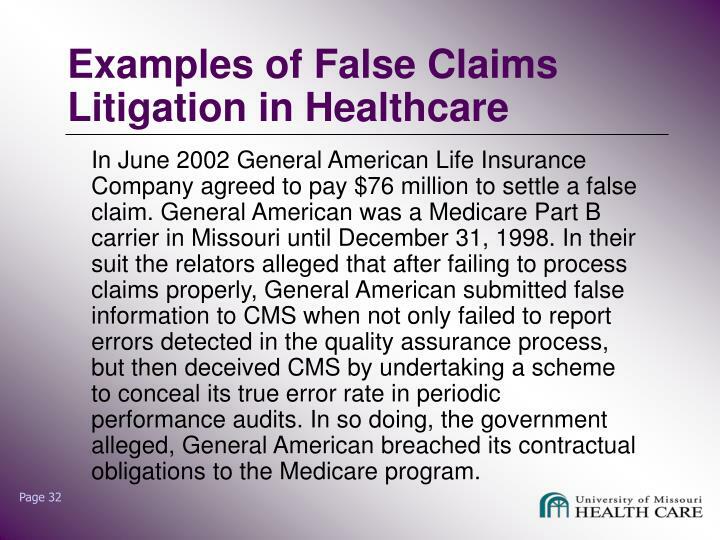 In their suit the relators alleged that after failing to process claims properly, General American submitted false information to CMS when not only failed to report errors detected in the quality assurance process, but then deceived CMS by undertaking a scheme to conceal its true error rate in periodic performance audits. 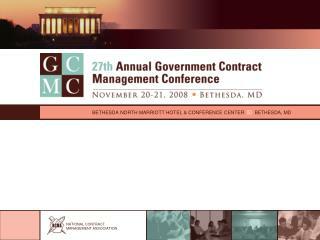 In so doing, the government alleged, General American breached its contractual obligations to the Medicare program. 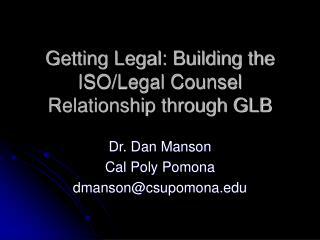 Legal Malpractice: Claims and Coverage Issues Facing Insurance Defense Counsel -. 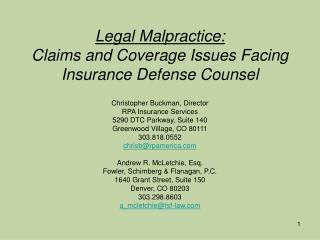 christopher buckman, director rpa insurance services 5290 dtc parkway, suite 140 greenwood village, co 80111 303.818.0552 chrisb@rpamerica.com andrew r.
OFF-LABEL MARKETING & THE FALSE CLAIMS ACT -Off-label marketing &amp; the false claims act . 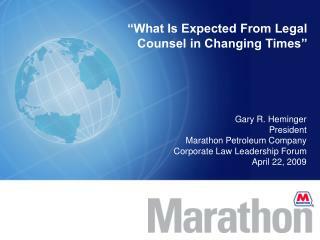 thomas m. greene greene &amp; hoffman. 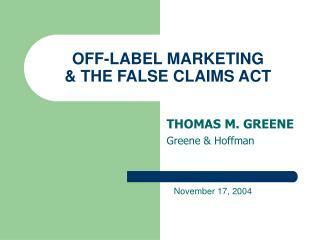 november 17, 2004. thomas m. greene	greene &amp; hoffman - boston, ma. thomas m. greene.